Dr. Davis Tsai is a board-certified orthopedic and sports medicine surgeon who specializes in shoulder and upper extremity surgery, sports medicine, knee repair and general orthopedics. 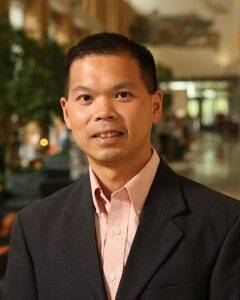 Davis Tsai, MD, joined the medical team at the Kennedy Center in 2002. He graduated medical school from Northwestern University in Chicago. He continued at Northwestern where he completed his internship and residency in orthopedic surgery. Dr. Tsai is board certified by the American Board of Orthopedic Surgeons and is board certified in Orthopedic Sports Medicine. He is a member of the American Academy of Orthopedic Surgeons and the Arthroscopy Association of North America. Dr. Tsai is also a ringside physician covering local amateur fighting events.